20 years ago today was Black Monday. October 19, 1987. People lost a LOT of money. In some cases their life savings. The TSX has been open for 45 minutes as at this writing. It's down 135 points. Seems like history can repeat itself. Hopefully it doesn't. Seems like people lost some money today too... as the index fell 2.3%, certainly no Black Friday, but a dark day none the less. Investment Advice: where do you get it? There are plenty of opportunities to get investment advice in this day and age. You can walk into any bank at anytime and almost instantaneously see a financial advisor. The Canadian Securities Institute owns the title Financial Advisor; sort of. Only CSI Securities Course graduates with a license can call themselves FAs. The life insurance/mutual fund people who have finished the financial planning courses offered through their professional organizations can call themselves Certified Financial Planners. No one else can use that CFP designation. CSI offers a professional financial planning designation, those certified use the PFP acronym. Accountants can offer financial advice too. CGA, CPA, CMA are all designations that require a huge commitment to achieve. The stuff you read about written by analysts are usually from people who have achieved the Financial Analyst designation through CSI. Realtors tout themselves as financial advisors when it comes to that forced savings plan that is your mortgage/house. So with all the different designations, who do you get your advice from? The best analysis I've read about financial advice is you get what you pay for. Now most advisors/planners don't actually charge you anything at all. Instead they get commissions on products they sell or deals they broker. So in this case are you really getting advice? I'll say yes and no. You get some advice, but that advice isn't always given without an attempt to influence you in a direction which you may not choose if you got that advice for a fee. The accountants in this world charge you a fee before dishing out advice. So when they speak up, I usually listen. And today they spoke up. Loud. But only 14 per cent of Canadians reported their own debt levels had gone up significantly over the past three years Me thinks someone's fibbing here, eh? Bold was me. So let's see: housing prices went up, which means equity and savings should have gone up, but we spent more, saved less, and basically looked this economic boom gift horse in the mouth. Do you think that may have been because we listened to people who were rewarded not for dishing out advice but for dolling out products? Remember I'm not a financial advisor. But I will tell you what I plan to do very soon now that I'm working again: pay a fee for service planner or accountant, even just once, to review our economic situation and recommend a plan to achieve our economic goals. I should add that not all FAs, CFPs and Realtors are shyster salespeople. Nothing could be farther from the truth. But very few can claim to have universal access to products and none can claim to give unbiased advice truthfully. That said, I'd happily recommend people I know in all three designations to my friends and family. But that won't prevent me from getting a truly unbiased opinion. UPDATE: want more reading on designations and how they glean their incomes? Check out this article from the Van Sun, Oct 19, 2007. Third in our series of "investment" products, today we're going to debunk the option myth. Feel free to refer back to the great discussion at this post. For the past few years on late night and Saturday afternoon TV we've been inundated with infomercials convincing us to attend "free" seminars offering to teach us how to dump our jobs, get rich quick and lead the lifestyle that Bill Gates wishes he could. And just what are these "gurus" offering to teach us? How to flip real estate and how to trade trends and use options. Now again, I'M NOT A FINANCIAL ADVISOR, nor am I a trading expert. If you asked me over a beer how much I know about options, I'd say more than most people but less than someone who trades them. I've never touched the things. But man do I want to. I'll admit, I enjoy a good game of poker. There is something about gambling with skill and a bit of intelligence that is oddly exciting. I figure options would be the poker equivalent of the stock trading world. And they certainly don't qualify as an investment using our definition form the above-linked post. Nope, pure speculation. Here's how it works: you borrow stocks betting their prices will go up or you lend stocks betting the prices will go down. The price you agree to pay is the price they were worth at the time of the contract. You collect the difference between the two prices if the contract is exercised. Really sophisticated options traders can even borrow stocks to lend out and thus play the game at both ends. These transactions are called "puts" and "calls." And they are complicated by time limits, so just when you think things may be looking your way finally, ding, ding goes the bell. This is an overly simplistic explanation that is full of inaccuracies, but you get the idea, non? It's trading on margin and you can lose as big or even bigger than you can win. Think buying a house right now and watching its value drop 40% in 6-months and you still owe the bank and you can't sell the house. Last I checked, you had to have considerable experience with a brokerage and considerable wealth to get into this game and stellar credit. You also had to have a brass jock or jill; these kinds of investments when they go wrong feel like a swift kick to the groin, I'm willing to bet. The best way you and I can get a taste of the action, without the knowledge or finances to back it up, is through investing in hedge funds. Even those are super risky. Just ask those people invested in the Bear Sterns hedgies that got dragged down to their death by the US housing market downturn. Anyone reading this playing this game? How's it going for you? Do you do it through an online trading system like Action Direct or E-trade? Inquiring minds would like to know. If I went to the meat counter at my local grocer and bought a package of hamburger that was two weeks old but marked as packaged yesterday, that would be fraud. If I bought a used car that showed 50,000 km on the odometer but had really been rolled back from 200,000 km - fraud as well. So, why is it perfectly acceptable to do the same thing with houses? H/T to comments at Victoria's Truth. Canadians love their mutual funds. Perhaps it's because we're pretty unsophisticated investors and fairly risk adverse? Regardless, there are more than enough funds to appeal to all types of investors, from conservative to aggressive. There are even funds of funds to further diversify your risk. Again, I'm NOT A FINANCIAL ADVISOR and this post is not advice. Rather it's just an airing out of my thoughts on an investment product. I own mutual funds. I don't trade them though. They're a five-plus year investment for me (with an almost immediate payback as dividends usually get reinvested). My favourite family of funds right now come from Front Street Capital and have done me pretty good over the past couple of years. I'm a value investor before anything else. What this means is I look for good deals. I like the price to sales ratio the best (not to be confused with price to earnings). There is a great performing fund family from investment guru James O'Shaughnessy sold through RBC securities. This is where I learned the price to sales ratio. James suggests that companies that you can buy $1 of their sales for less than $1 of your money, and that are over $250 Million in market cap, chances are pretty good you'll beat the market. His funds almost always beat the market. And he charges well below the average MER to do that. For all the benefits of mutual funds, I strongly believe that when you get over the $10,000 net assets invested mark you are better off investing directly into companies (10 plus). You have to pay more attention to your investments, but isn't that part of the fun? Since I've been doing this (paying attention), I've not only learned more, but had more fun saving and investing than in reading mandatory mutual fund prospectus statements. I'm not sure if this will spark the kind of discussion we enjoyed earlier today, but we'd like to hear your thoughts on mutual funds. Are you in or are you out? Is YOUR home the investment you think it is? The answer to that question is an age-old and apparently endless debate. I figured we'd have a little fun around here this week. Each day I'm going to comment on some commonplace investments and offer my opinions only--SEEK PROFESSIONAL ADVICE ELSEWHERE BEFORE ACTING ON ANYTHING I SAY, I AM NOT A FINANCIAL ADVISOR--on whether they qualify as investments in the HHV household. If you have a particular product you'd like to see pumped or dumped, email us using the link at the top right. Is your house an investment? By your house I mean the one you are living in. Here's my answer: probably not. If you live in a home that you rent, it may qualify as an investment using my definition if it is wholly owned AND providing a net income to the owner. This is the only circumstance where I would say that a home is an investment. But in this case it's someone else's. How do I get to make that assertion? Because many, not all, but many financial advisors require an investment to provide an almost-immediate financial return. If you buy a blue-chip stock, you're likely purchasing stable long-term growth and a DIVIDEND--which is an almost immediate return on your investment. If you buy a small cap stock, you're likely speculating on a story and hoping for greater returns in the short term in exchange for waiving your right to demand an almost-immediate return on your investment (few if any small caps pay out dividends). Trading small caps, which I frequently do, is speculating, not investing, and is akin to little more than gambling, but with better odds than a Vegas craps table. So the rental house you live in is not likely paying out a dividend unless the landlord collects more than she puts out in mortgage, tax and maintenance. The same can be said for owner occupied homes. How can an owner occupied home possibly be an investment using my definition offered above? Some may argue that having a two-bed mortgage helping suite downstairs means their house qualifies as an investment property. I say Nay Nay. 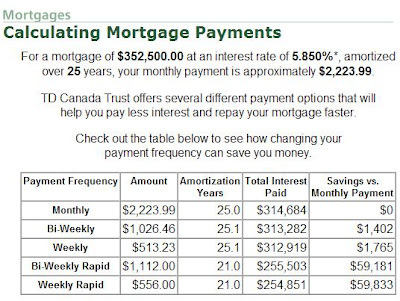 That mortgage helper means you pay less of your own income to your mortgage, but considering that the bank will only count half of what you take in in rent towards earned income for mortgage qualification, you can see how they feel about the "quality" of that "investment." We here at HHV tend to agree with that practice for the most part. Most people, us included, believe owning is better than renting in the housing market. You're better off to own eventually than never to own at all. Real estate returns in Victoria are averaging about 6% per year for the last 30-odd years. Adjusted for inflation, and again we'll defer to the pros, who advise 4% assumptions, 2% real growth isn't exactly stellar. Stable, yes. Tax preferred, yes. But "outperforms the market", I say Nay Nay. The only time you realize a gain from your house is when you sell it or borrow against the "equity." I don't think taking a loan out is a good investment, but many real estate flippers turned financial "educators," recommending you leverage your equity to buy and sell distressed properties in dirty neighbourhoods, will argue I am nothing but a nay-sayer who is risk adverse. I'd tell you I'm just not risk-tolerant enough to buy into the shill and suffer the Casey-like consequences. Yes, some people make a lot of money buying and selling distressed properties. But the average income earning citizen in Victoria, in these current market conditions, won't. Now my previous post was about a friend of mine who is likely to experience a significant financial gain by selling his house and buying another one. He'd argue me blue in the face about how his two homes were the best investments he'd ever made. I wouldn't have much to say to him other than if you weren't leaving town, would you feel the same way buying across or up in this market that clearly has little upward room to grow? Their income supports their current mortgage comfortably. They could stretch up another $100K or $500-$600/month. But that would be the difference between owning a nicer home and having a family. Yes, that's a personal decision. But it affects financial planning and once again takes money out, not puts money in, so his house isn't an investment if he stays in it, or moves to a more expensive one in town. Let's recap: a home is an investment when the owner realizes a positive net gain in her income. That's income minus expenses, so the rental suite doesn't count unless it's paying all of your mortgage, taxes and maintenance too. Sure you get a tax-preferred capital gain if you live in it and it gains in value over a year's period. But considering that real YOY real estate returns are hovering around 2% over 30 years, your home is far more likely defined as a forced savings plan rather than an investment. Tomorrow we'll move on to mutual funds. Post your suggestions for other product topics in comments or via email. And as I always, I invite, or actually in this case I beggingly-demand, that you pick my opinions apart in the comments. I'm hoping this stirs up a lively debate. I had a beer with one of my best friends last night. His sister lives in Regina. He's a contractor. This market has treated him well. He's responsible, honest, ethical and hasn't taken advantage of anyone over the last two years that he's been self employed. And he's leaving. And I can't say I blame him. Sure he's married, but he's not uprooting kids and his wife will have better teaching opportunities. Not that it will matter. They have about $300K in equity in their Gordon Head house. They bought first in 2002. Took out a 14 year mortgage and paid it down as fast as they could. Bought and sold again in 2006. Best part for them? 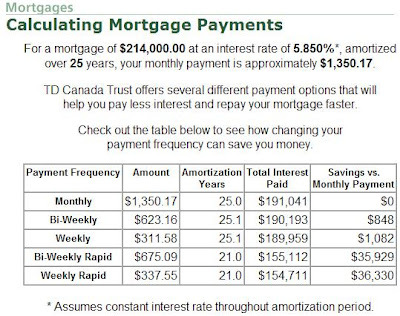 When they buy an above average house in a nice neighbourhood in Regina they will be mortgage free. And they'll feel good about having the 2-3 kids they want but don't think they can afford here. And they will be able to have one parent at home until the kids start school. Sure the winters are cold. But the sister who grew up here and now lives there with her four kids and husband love their lifestyle. When they come here to visit, they don't talk about how much they miss Victoria, they talk about how great Regina is for their family. And so my friend and his wife will leave. And I can't say I don't understand. Early thirties and mortgage free. I have to wonder why more of Victoria's young workers aren't leaving? Maybe they are. Check out this article from the TC today. Apparently markets are cooling. Apparently builders aren't getting much for their investments here. But apparently anyone who has owned a home in Victoria, for 5 years responsibly, has a pretty good opportunity to move to a more family friendly place and live with little to nothing in the way of a mortgage. I should add that wages are pretty similar between Victoria and Regina. I should know. I've been looking very intently. I'm not sure what the true state of the rental market is here. September is always a stupid month because of the return of students; that skews everything and landlords get greedy as evidenced by the numerous articles in the TC about how difficult and expensive it has become to rent in Victoria. To be honest, I don't buy it. I don't think it is difficult, nor expensive to rent here. I think it is difficult to find a quality rental. But I don't think you pay much of a premium for that. I'm not sure what historical rents are here. I don't know what price per square foot has been. But I'm guessing that plus or minus 20% of $1/SF is reasonable depending on what and where you are renting. Case in point, here's a listing obviously aimed at students on the Uvic off-campus rental site. Three beds plus den, 1500SF $1500/month. A quick perusal of craigslist.org doesn't show too much deviance from the $1/SF norm I'm suggesting. Anything that does typically includes utilities or offers "individual living" which I read as being only big enough for one. Over at usedvictoria.com we see much of the same: places for rent, and prices that are not completely out of whack with incomes. Yes it is not cheap, or really "affordable" to rent in Victoria. But rents have not even come close to keeping pace with the hyper-inflated prices being asked for condos and SFH in this town. In my observations renting is almost 50% less than owning a similar unit right now. Which means no one should be buying revenue properties with anything less than 100% down right now. Vancouver's housing prices continue to defy the laws of gravity, but they won't be able to indefinitely thwart the laws of economics. All markets -- from tulips to tech stocks -- are subject to supply and demand and the housing market is no exception. The question then is not if prices will eventually be subdued but whether that re-alignment will come abruptly, and painfully -- or gradually and gently. While we await the inevitable, however, sales of residential real estate in British Columbia are expected to reach the second-highest level in history this year, about 5,000 transactions shy of the record 106,310 sales set in 2005. The average home price in the province will be up 12 per cent this year to $437,000. After that, if the B.C. Real Estate Association has it right, the number of sales will drop to 96,671 and the pace of price increases will subside to about eight per cent. Of course, Metro Vancouver is in a league of its own, with an average price of $589,916 and forecasts calling for it to rise to $620,000 next year. In the City of Vancouver, prices are higher still: $787,500 for the average bungalow and $879,000 for the average two-storey home, according to realty firm Royal Lepage. Home ownership costs would consume more than 70 per cent of the typical household's pre-tax income, based on an affordability index devised by the RBC Financial Group. Forbes magazine declared last month that Vancouver real estate was the second most over-priced in North America, after Los Angeles, and sixth most over-priced in the world. As such, analysts agree, house prices are out of sync with local incomes and are unsustainable. Population growth, baby-boomer affluence and a robust economy are often cited as reasons for the relentless rise in real estate prices. Low interest rates and mortgages with 10 per cent down, extended amortization, and interest-only payments (not to mention subprime loans), are attracting buyers who otherwise would not qualify. But just as the typical wage earner cannot afford the Lotus, Ferrari, Lamborghini and Mercedes-Benz SL automobiles parked in so many driveways, the ordinary household cannot spend nearly three-quarters of its pre-tax income on housing. So who's buying? Theories abound about their identity. Some say offshore buyers from Europe and Asia are scooping up property, particularly downtown condominiums, while wealthy foreign buyers, especially from China and Iran, are buying homes to house their families, many paying in hard, cold cash. Another theory has it that drug dealers are buying property to turn their illicit gains into hard assets. That might help explain why Vancouver real estate prices seem less vulnerable to normal economic forces, but sooner or later the gorilla in the room will makes its presence known. Vancouver's real estate market may be influenced by unique circumstances, but it cannot remain immune from the credit crisis spilling over from the United States. Sales of new homes in the U.S. dropped by an annualized rate of 8.3 per cent in August. That was more than forecast and the largest drop since 1970, bringing the number of transactions to 795,000, the lowest level in more than seven years. The median price dropped by 7.5 per cent from a year earlier. If the U.S. credit malaise spreads -- and the Bank of Canada's injection of nearly $5 billion to shore up money markets over the past few weeks suggests it has -- real estate prices could either plateau or plummet. So far, the market's defiance has made fools of analysts predicting an end to the boom. I agree. Fair. Balanced. Accurate. 'Nuff said. H/T to VG. Ms. HHV and I kinda have a big day today, and then hopefully we shouldn't be around much this weekend. Here's your open thread to discuss whatever you'd like. Surprise, surprise. VREB wants the provincial government to increase the thresholds for first time buyers to skip paying the property transfer tax. I've written about this before. Reductions in consumption taxes lead to price increases, not decreases. This isn't about the FTB being priced out forever, this is about a cooling RE market due to unsustainable market forces. First-time buyers "save and save," Bev McIvor said in an interview yesterday -- and "to find out they are going to have to pay some kind of property-purchase tax really makes a difference." Sorry, Bev. Some FTBs "save and save" but many FTBs "borrow and borrow" from their parents, banks and credit cards just to come up with a down payment. And now that you don't need a down payment, many FTBs are getting into the market when they otherwise couldn't have, and when some economists would argue, that they shouldn't have. Dropping $7,000-$10,000 on a house priced between $430,000-$480,000 will not make a lick of difference for affordability. "Government can argue that the threshold still nicely applies to the condominium market but we believe the intent of the program was not to restrict assistance to only buyers of condominiums." I haven't heard that argument from government. And guess what? FTBs can leave Victoria and Vancouver and buy a really nice house and qualify for the exemption. Which, it seems, many are considering, and actually doing. Except here of course. I've long been touting that inflation is bad. I'd wager it's as bad as it was during1979-1981. Of course, it's not reported as such. Nor are the interest rates indicating as much. But remember that inflation was only 3% lower than interest rates in 1981. Guess what? Same as today. This is the precise point of entry for the new money that the Fed creates out of thin air. To repeat: When the Fed buys (say) $1 million in bonds from Bank XYZ, Bank XYZ surrenders ownership of the bonds but sees that its deposits of reserves at the Fed go up by $1 million. But the Fed didn't transfer this money from some other account. No, it simply increased the electronic entry representing Bank XYZ's total reserves on deposit. There is no offsetting debit anywhere in the banking system. Bank XYZ now has $1 million more in reserves, while no other bank has less. Bank XYZ is now free to go out and loan more reserves to other banks, or to make loans to its own customers. (In fact, due to the fractional-reserve system, the bank could make up to $10 million in new loans to customers.) The money supply has increased, putting upward pressure on prices measured in dollars. If you think this problem is isolated to the US, think again. Over the last few weeks, and quietly over the last few days, the Bank of Canada has been doing much the same thing in Canada. Billions, I say that again, Billions of dollars have been DUMPED into the overnight financial system in order to defend the key overnight interest rate. What does this mean? If the BoC had not printed money, it would of either triggered a catastrophic financial event that would send the markets reeling or it would have had to lower the interest rate and increase inflation. This underhanded move--quietly dumping cash into the system to keep lenders liquid--has the same effect, without the psychological ramifications of an interest rate drop. Look out. The BoC using the CPI has turned steak into hamburger, lobster into prawns, SUV's into sub-compacts, and chicken into tofu. This has had the effect of artificially driving inflation rates down. Inflation is high. Much higher than you and I would like to admit. This has huge economic ramifications. Do your homework. And then teach the rest of us here at HHV. I'm not a reporter and I'm slightly imbalanced. I make no pretenses about my status as a doggedly bearish RE market pundit. Read this site for two minutes and you've got that figured out. But what about the MSM? Many people trust that the news is balanced and free from bias. Bias appears in editorials and letters to the editor, not in news stories, is the naive belief, right? Take this story for example, how balanced is it? The average price of a single-family home in Greater Victoria has once again hit a record high, reaching $584,193 in September. The new mark mashed the previous record of $576,632 set in August. Last month, the median price of houses -- the midway point of everything sold -- also moved up to $520,000, from $515,000 in August. But while the average and median prices are rising, there is a buzz in the industry that the market is starting to cool. September saw a total of 632 sales through the Multiple Listing Service, down from 846 in August, the Victoria Real Estate Board said. Even so, overall sales for the first nine months of this year are running 12 per cent above the same months in 2006. As is usual in this market, several sales of high-priced homes went through last month. Board president Bev McIvor said there were 17 single-family home sales of over $1 million and this had a significant impact on the overall average. She said nearly a quarter of all single-family homes sold during September for less than $425,000. The average price for condominiums sold last month was $341,014 and the median was $288,500. And townhouses earned an average price of $402,313 last month, with a median price of $375,000. A total of 3,381 properties were listed on the local MLS at the end of last month, down from 3,449 in September 2006. Of the single-family houses that sold in September, the average time on the market was 43 days, down from 56 days in September 2006, board numbers show. Daniel Clover, of Genesis Group Real Estate Inc., said days-on-the-market statistics are showing that if homes are priced correctly, they get sold. Clover has been talking to fellow real estate agents and the sense is that while the market is still active, it is beginning to settle. "We have got fewer people showing up at open houses, we've got fewer sales going through, price reductions are becoming more prevalent ... The buzz phrase right now is, 'If it isn't priced right, it won't sell.'" Greater Victoria is a "price-sensitive" market, Clover said. "There is a change going on out there. Buyers are not jumping at the first home they see." When prices come down, the drop is often larger than normally seen in the past few years in order to catch the attention of buyers, Clover said. He believes that homes are staying on the market longer than a year ago, referring to all residential properties, not just those sold. Even so, the market remains healthy because there is a demand for Victoria properties, Clover said. Disaster is not looming and the economic indicators back that up, he said. "We have not overbuilt to excess," Clover added. This is a good time for buyers because they are in a position to negotiate, he said. Local MLS sales last month included 335 single-family houses, 150 condos, 77 townhouses, and 21 manufactured homes, the real estate board said. Total residential sales value was just over $279 million. Saanich East saw the largest number of single-family sales, with 62 sales at average price of $616,027. Langford followed with 35 single-family sales, with an average price of $490,379. Langford topped the number of townhouse sales with a total of 28 and an average price of $326,021. Victoria beat other areas in condo sales with 69 and an average price of $322,914. Saanich East and Langford tied for second place with 15 sales each. Normally anything I steal from websites I italicize so that you aren't confused that I wrote it. I don't do that here because I italicize bull terms and bold bear terms. Here's the count: Bulls: 11 Bears: 10. I point out the one statement that can be construed either way, some think 17 sales over a mill is great for the market, some think it inappropriately skews the average. So I counted as 1 each. That said, the MSM has picked up the cooling story. Even given it a tag in the sub-headline. Times are changing. This is almost balanced. I ran with a Realtor I know tonight. I was asked, "still looking?" I responded with, "um, not seriously, but still blogging about the market. Kinda funny right now. You still renting?" The response to my question: "You'd have to be crazy to be buying right now." That came from the horses mouth. Considering that since last Friday the BoC has dumped a billion dollars a day to prevent having to drop the interest rate, I'd say that the storm is brewing. If the BoC does the right thing and checks inflation now with a rate hike or at minimum no rate changes, and no more dumping cash into the market, we may be saved from long term pain. If they don't, I'm thinking the similarities to 1981 are too striking to believe that a different outcome is a given. VREB numbers are out. I'm not going to do much analysis other than to repeat what VG has already said (with an edit): "sales are down considerably from August (25%) and prices are basically flat for the median SFH." Condo median prices jumped almost $15,000, though I don't give much weight to this number because the number of condos sold is so relatively small that blips like this are common. CMHC is forecasting that housing starts in BC will total 14,100 this year, down 13.5% from the 1999 level. A surge in demand for high-end homes (those costing $500,000 or more) is not expected to be strong enough to offset the effect that higher interest rates and construction and land costs have had on the market for entry-level home buyers. The cost of new housing in BC’s two biggest urban centres continued to fall in August. The new housing price index (NHPI) in Victoria was down 4.4% from a year earlier, while Vancouver’s NHPI slipped 1.0%. Elsewhere in Canada, only two urban areas–Saint John-Moncton-Fredericton (-0.4%) and Sudbury/Thunder Bay (-1.3%)–saw the cost of new housing decline. Prices are rising in other cities, at rates ranging from +0.9% in Windsor to +7.2% in Ottawa/Hull. Overall, new housing prices were up 2.4% from August 1999. When was this from? October 13, 2000. And they say Victoria is different. What was happening back then? Stock market was uber-bullish, the NDP government of BC was on the way out, and developers were ready for a pro-business change. Even then they claimed no one could afford the product on offer. So what does this mean? Just more confusion for yours truly unfortunately. My best guess: the markets change, but the rhetoric doesn't. Man, do times ever change fast in the RE market. That was 7 years ago, almost to the day. Someone. Please. Help. Us.